Brighten up your Friday with a wild dose of animation inspiration. It’s Friday. Fancy a spot of trippy animation eye-candy to ease you through the day? Then please, allow us. 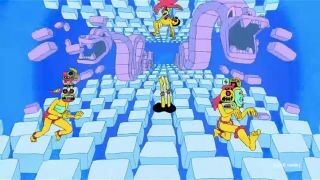 Our favourite new animation this week by far was Adult Swim’s trailer for the new season of eccentric animation series Rick and Morty. Titled Exquisite Corpse, the insane short features sequences created by a stellar cast of top animation talent, taking you on a journey through some 22 different animation styles. The clip, which was directed by illustrator Matt Taylor, takes inspiration from the surrealist drawing technique of the same name – Exquisite Corpse – in which different artists draw a section of a body without seeing the others beforehand. Aided by an instrumental version of Run The Jewels’ Thursday in the Danger Room, it’s makes for the perfect Friday viewing – and a cracking way to gear up for the weekend.